Leo Ernest Durocher was born Born on July 27, 1905 in West Springfield, Massachusetts. The second baseman / shortstop made his MLB debut in 1925 with the A.L. New York team & played with BaBe Ruth & Lou Gehrig in the 19278 World Series. 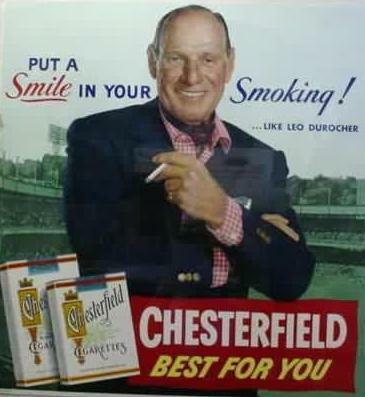 Leo, who was never a great hitter, was dubbed “The great American out” by Ruth. Manager Miller Huggins loved the passion, & competiveness in Durocher but upper management hated him. Leo loved the nightlife, stayed out late, passed out bad checks & dressed in expensive clothes. 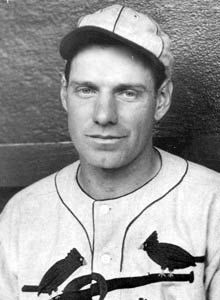 After the 1929 season Durocher went to Cincinnati for four seasons getting traded to the Cardinals i May of 1933. He arrived in time to play on the 1934 St. Louis Cardinals World Champion “Gas House Gang” team. He had his best batting averages in St. Louis (.260 in 1934 & .286 in 1936) while driving in over 70 runs twice, & hitting 20 plus doubles three times. In the 1934 World Series he hit .259 (7-27) scoring 4 runs. In Game #6 Durocher scored two runs including what turned out to be the game winner in the 7th inning. After doubling off School Boy Rowe, Durocher scored on Paul Dean’s base hit putting the Cards in front of Detroit 4-3 and forcing a Game #7. After four seasons in St. Louis Durocher went to play for the Brooklyn Dodgers for six years finishing up his long 17 year career. He batted .247 with 24 HRs 210 doubles 567 RBIs in 1637 games. 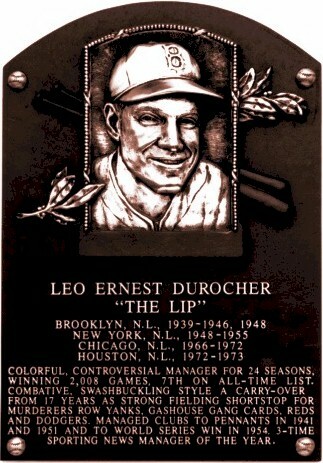 In 1938 he was named the teams Player / Manager and right away Leo the Lip became legendary. He was controversial, brash, & very argumentive. He always wanted to win & would do anything to earn a victory. The fiery Durocher demanded the same from his players as well. 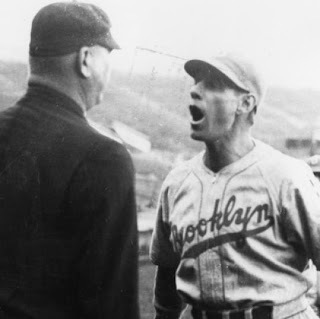 He was famous for yelling “stick it in his ear” & had his pitchers regularly throw at hitters. 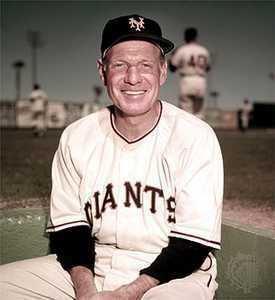 In an interview with Red Barber, he coined the famous phrase “nice guys finish last” in reference to New York Giants manager Mel Ott. The Giants who were “nice guys over there in the other dugout” were in last place, while Durocher’s Dodgers were riding high in first place. He took over the helm in Brooklyn after the team suffered six straight losing seasons. Durocher’s team finished would finish with a losing record all but one season while he was there. His Dodgers won the 1941 NL Pennant, then would win 104 games in 1942 just missing another World Series berth. In 1946 the Dodgers & Cardinals tied for first place forcing the N.L.’s first ever playoff series. Durocher’s team was on the losing end. 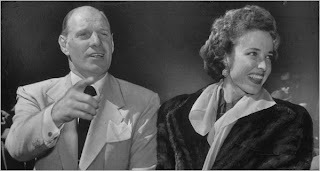 Off the field Durocher loved the celebrity life, he was friends with George Raft, Frank Sinatra & Dean Martin. 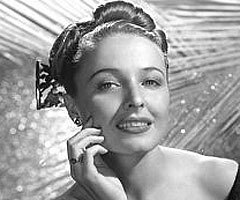 He had an affair with married actress Loraine Day, that upset many people especially Brooklyn’s Catholic Youth Organization. The two would later elope in 1947 & stay married until 1960. The couple were instant media celebrities, seen on television, Broadway & around Hollywood. In addition Leo hung out with gamblers, and was a noted pool shark himself. Besides his celebrity & gambler friends he had known ties with mobsters. In 1947 two of Durocher’s coaches were hired away by the A.L New York club, causing a feud between the two. Each accused the other of having ties with gambling in their respective clubhouses. With all the controversy going on, Commissioner Happy Chandler discovered Durocher & Raft may have rigged a crap game taking a Detroit player for a lot of money. 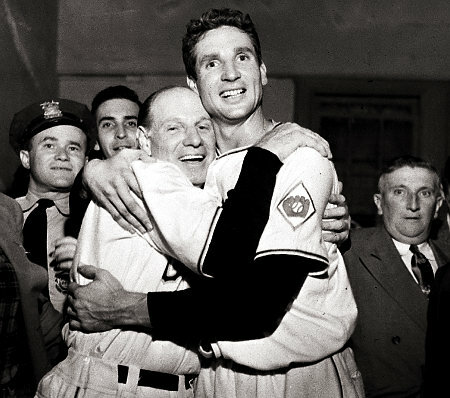 Durocher was suspended for the 1947 for having ties with gambling. Before he was exiled, he let it be known that he would not tolerate any dissent of players who were opposed to the promotion of Jackie Robinson to the MLB club. "I don't care if the guy is yellow or black, or if he has stripes like a damn zebra. I'm the manager of this team and I say he plays." The Dodgers went on to win another pennant in 1947 while Durocher was serving his suspension. Durocher returned in 1948 but the Dodgers struggled, and his outspoken personality was causing trouble with management. In a strange deal worked out in July, Leo was set free from the Dodgers & allowed to go to the rival New York Giants. A move that fueled the Giants / Dodger rivalry even further, and had Dodger fans immediately hating Durocher. 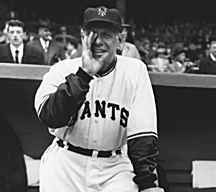 The Giants fans took a deep breath and tried to digest Leo Durocher, as their manager! Ironically Durocher would replace the man he called a “nice guy”, Mel Ott as manager. It took time for Leo to build the type of team he wanted at the Polo Grounds, he recruited guys like Eddie Stanky, Alvin Dark, Hank Thompson, Monte Irvin & a superstar kid named Willie Mays. 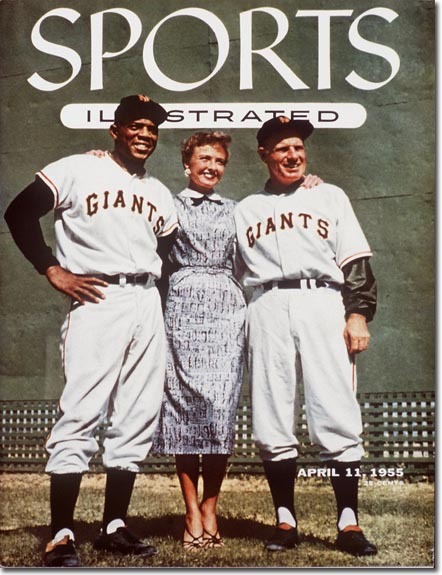 After two 5th place finishes the Giants moved to 3rd place by 1950. In 1951 Leo led the Giants to one of baseball’s greatest comebacks ever. He helped mentor rookie Willie Mays after Mays slumped in his first few weeks. Mays was crying at his locker telling “Mr. Leo” as he called him, that he couldn’t make it & he was sorry for letting him down. Leo told Willie he was his centerfielder and was sticking with him. Mays turned it around, and became one baseballs greatest players of all time. After getting beat by the Brooklyn Dodgers at the Polo Grounds earlier that summer, he told his team to listen to the Dodgers taunt them “the Giants is dead” as they banged on the thin clubhouse walls of the Polo Grounds. His battles with the Dodgers were classic, he once had Ruben Gomez throw at Carl Furillo, instead of charging the mound; Furillo went after Durocher in the dugout. His battles with Jackie Robinson also legendary; He would taunt Robinson mercifully, but nothing racial, and Jackie would do the same back, even attacking Durocher’s wife Loraine Day. Leo did anything he could to inspire his team. He also recruited a Polo Grounds electrician to install a buzzer from the clubhouse to the bullpen. Then he perched his old friend Herman Franks in the centerfield clubhouse with a telescope to steal the signs from the opposing catcher while the Giants were up to bat. Franks would use the buzzer after he saw the sign to signal the bullpen, there backup catcher Sal Yvars would either toss a ball in the air or just hold on to it, to tip off the hitter. This method has been disputed by many as if it actually worlked or not. Statistics show the Giants actually hit better on the road, and had better pitching at home. Many players said they never actually used the system & even if they knew what pitch was coming they still had to hit. Either way the Giants were 13 games back on August 11th and after getting swept in Brooklyn they turned their season around. Leo’s Giants went on a 16 game winning streak and won 23 of their last 31 games tying the Dodgers for first place and forcing the most famous playoff Series in baseball history. The teams split the first two games and it all came down to one game at the Polo Grounds. The Giants were down 4-1 in the 9th when history was made as Bobby Thomson hit the shot heard round the world, the most famous HR in baseball history as the Giants win the pennant, the Giants win the pennant . The Giants would win 90 games in 1952 but finish second to the Dodgers, 1953 was total disaster finishing 5th. Going into 1954 the Giants were not picked to win, and surprised everyone. After trading off popular 1951 hero Bobby Thomson, the Giants received pitcher Johnny Antonelli who would win 20 games, lead the league in winning percentage & ERA. That season Willie Mays won the batting title & the MVP Award. Leos Giants went on to win 97 games, and sweep the Cleveland Indians (who had won 111 games) in the World Series. 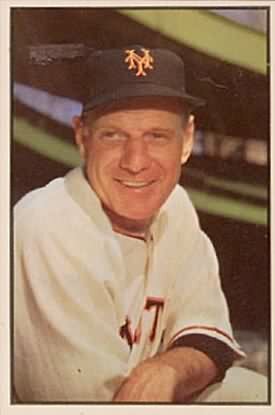 After the 1955 season Durocher was through with the Giants. He went to work for NBC as a baseball color commentator & a host for the NBC Comedy Hour & Jackpot Bowling. In 1962 he was back with the Dodgers this time in Los Angeles. Hollywood was perfect for Leo, during the sixties he appeared on episodes of many classic TV show. He played golf with Jed & Jethro Clampett on The Beverly Hillbillies, & wanted to sign a talking horse to a Dodger contract on Mr. Ed. Then there was the classic Munster’s episode where Leo wanted to sign slugger Herman Munster after seeing him blast monstrous HRs. 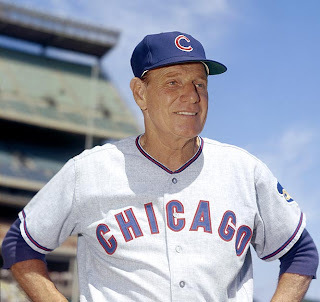 In 1966 he was hired as manager of the Chicago Cubs, there his Cubs were the fisrt team to finish behind the early last place Mets teams. By 1969 the Cubs had a powerhouse team, and led the newly formed NL East by 8 ½ games in mid August & looked like a shoe in for the post season. But 1969 was the year of the Amazing Mets, & after losing two critical Series to the Mets in July, then getting swept in a two game Series in August, Durocher’s Cubs fell apart. After a loss to the Mets he was asked “Are these the real Cubs?" Durocher answered "I don't know," "but these are the real Mets." They ended up losing their lead and finishing 8 games behind the Mets. Durocher was criticized for over playing his top players without rest & over working his pitchers. He had ahard time dealing with the new breed of high paid ball players, having run ins with his stars Ernie Banks & Ron Santo. He was fired midwaythrough the 1972 season and getting hired by the Houston Astros. He retired after the 1973 season & another Mets Pennant. Durocher finished his managerial career with a 2008-1709 (.540 %) posting winning records with all four teams he led. He was the first manager to win 500 games with three different clubs & was elected to the baseball Hall of Fame in 1994. He also wrote a bestselling autobiography called “Nice Guys Finish Last”. Durocher passed away in 1991 at age 86, and is buried in Forest Lawn Cemetery in Hollywood.